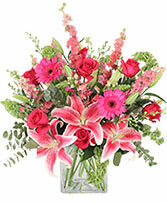 Clear Rectangle Vase, Foliage: Baby Blue Eucalyptus, Pink Larkspur, Bells Of Ireland, Deep Pink Roses, Deep Pink Gerberas, Pink Snapdragons, Stargazer Lilies. Crystalclear Plastic Design Dish, Wet Floral Foam, Crumpled Cellophane (To Hide Foam), Foliage: Galax, Huckleberry, Lily Grass, Shortstemmed Red Roses, Sunset Heather. 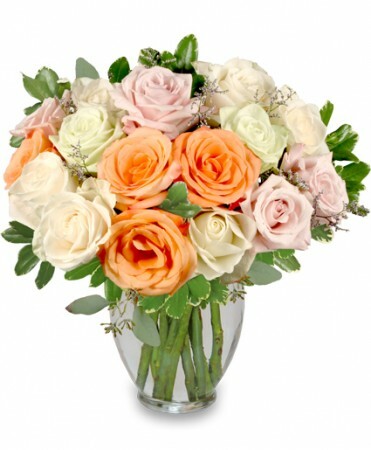 Rose Vase, Foliage: Myrtle, Pink Lilies (Sorbonne), Hot Pink Roses, Pink Gerberas, Pink Snapdragons, Hot Pink Barronia, Antique Green Hydrangea. 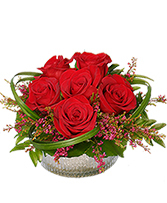 Marji's Florist provides custom hours when necessary. Please call us in advance and we will accommodate!